Tuthmosis' principal queen was Hatshepsut-Merytre but there were other minor queens, several of whom had been acquired almost as diplomatic exchanges. The court was further expanded for a while by a number of foreign princes, who were held hostage while they received strict instruction in Egyptian ways; they would then be returned to their homelands, duly groomed as obedient vassals of Egypt. The reign of Tuthmosis III was noted for its opulence and this is reflected in the superb quality of the tombs of some of the high nobles that have survived. Principal amongst these is that of the vizier Rekhmire (TT 100), with its teeming scenes of daily life and crafts, and especially the two long inscriptions that provide valuable information on the installation and office of a vizier. The tomb of the High Priest of Amun-Re, Menkheperresoneb (TT 86), Rekhmire's religious 'opposite number', was also nearby. When Tuthmosis III died in c. 1450 BC, his principal queen and mother of his heir, Hatshepsut-Merytre, survived him into the reign of her son as Queen Mother. 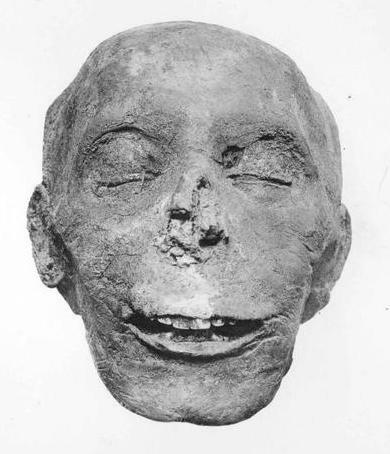 Tuthmosis was interred in a tomb in the Valley of the Kings (KV 34) with its entrance halfway up the cliff face. Once the burial had been completed, masons hacked away the stone stairway that had led up to the now concealed entrance. Ancient robbers found their way in, nevertheless, and despoiled the tomb, its principal burial hall and the four side chambers. When it was rediscovered in February 1898 by Victor Loret, all he found was the carved sarcophagus and the sorry remnants of smashed furniture and wooden statues. Rather curiously, amongst all this debris there was no trace of even a fragment of a ushabti of the king and, indeed, none have ever been recognized. The mummy was missing because it had been discovered 17 years before, in 1881, in the great royal cache at Deir el-Bahari, where it appears to have been reburied after Year 11 of the 22nd Dynasty pharaoh Sheshonq I, c. 934 BC. It was identified as the body of Tuthmosis from the scraps of original wrappings still on it and it lay in its once gilded, but now stripped, original outer coffin.